Sonny Lowe’s illustrious hockey career began in the 1940’s with the Port Dover Minor Hockey Association and continued for decades as an elite player, and as a successful coach, manager and president. His efforts were rewarded with a Life Membership from the PDMHA. 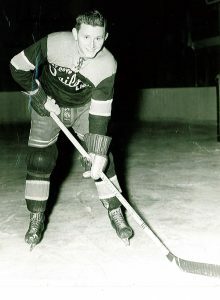 Sonny was a star on the Port Dover Juvenile OMHA finalists in 1945-46 and 1946-47. He was an MVP while playing Junior B for the Brantford Bruins in 1948-49 and for Simcoe, OHA Junior B semi-finalists in 1949-50. He was a valued member of the 1951-52 Simcoe Gunners OHA Intermediate champs. Sonny won ORHA championships with the Jarvis Chevys and the Port Dover Thunderbirds. He later starred for the Port Dover Sailors Intermediate hockey club. He coached Juvenile and Junior hockey in Port Dover, and Junior and Intermediate in Simcoe. He guided the Port Dover Juveniles to the OMHA finals in 1954-55 and Simcoe to the OHA Junior B finals in 1955-56, a team that featured Chico Maki. Sonny played Southern Counties baseball with Red Kelly and coached the Port Dover Juniors to an OBA championship in 1957 but Lowe was more than just a player and coach. He refereed industrial hockey and umpired baseball and softball. He helped fund-raise for many projects including the Port Dover Arena. Sonny’s community involvement went well beyond the arenas and playing fields of Norfolk. At the time of his induction, he had been a Lion for 50+ years, was a member of the City of Nanticoke Council, Haldimand-Norfolk Regional Council, the Harbour Marina Board and the Norfolk Board of Education. He was committed to building Doverwood Public School, the development of the Lynn Valley Trail, the building of the Norfolk Women’s Shelter and Port Dover Lighthouse Theatre. The Port Dover resident, as a ten year old, received a certificate from the Earl of Athens of the Boy Scout Association for rescuing his friend from the Lynn River. Lowe has had a street named after him and in 1994 he was Port Dover’s Citizen of the Year.